The Excelsior Cornet Band is New York State’s only authentic Civil War brass band. 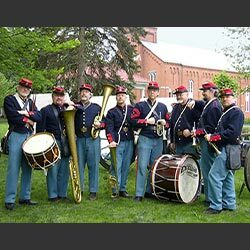 Founded in 2001, the band performs Civil War music on original 1860s brass band instruments. Its members are professional performers deeply experienced in many musical genres. Their uniforms portray an early-war New York Militia band. The band has presented concerts, educational programs, and living history portrayals for numerous organizations and municipalities. Their 2006 CD, "Cheer, Boys, Cheer! ", won a SAMMY award. No other musical group in New York can so authentically recreate the glorious experience of this important period of American history.